With the recent purchase of Flahey’s Nutritionals, AHF is incorporating diverse nutritionals products including organic infant formula to the current range of products. August 2014: Australian Dairy Nutritionals Group (ASX: AHF) first listed on ASX with two South West Victoria / Golden Triangle dairy farms. Since then four additional high quality dairy farms in close proximity to the main farms were added. April 2016: the Group acquired its own milk processing facility - the milk, butter and yoghurt manufacturer, Camperdown Dairy factory at Camperdown within 20 minutes milk-tanker drive from the main farms. The Strategy was based on vertically integrating high quality milk from prime dairy farms through to dairy products on supermarket shelves, investment in company owned brands and to move from being a commodity producer at the low value and high competition level to becoming a participant at the high value, high barriers to entry and high growth rate end of the market. This is being progressively achieved with new high value products launched in supermarkets around Australia in FY2019, which are showing strong national sales volumes from January 2019 onwards. Commenced conversion of all company farms to produce Organic milk and fodder. Progressively and strategically, move to the production of Organic Infant Formula made from Australian produced milk. 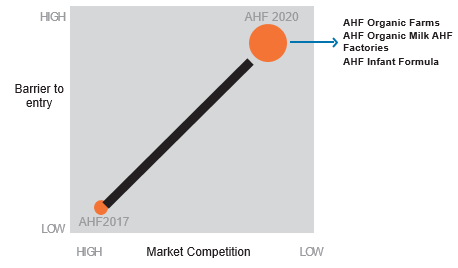 This acquisition is a low risk and comparatively low cost with much faster time to production than a new, to be constructed and imported plant, which will see AHF producing powder and infant formula in 2020. It will be reassembled on industrial land at Camperdown Victoria owned by the Group. AHF’s goal for 2020 is to be the first listed organic infant formula producer to be vertically integrated producing Organic Infant Formula from organic milk produced on its own Australian farms. The board comprises four active directors including Peter Skene the CEO who together have a strong combination of financial, legal planning and business experience and the CEO, like several of the operational management, has a lifetime of experience in virtually every aspect of the Australian dairy industry from farming to processing at every level and senior management. Directors & Management are highly invested in the Group owning in excess of 30% of the capital of the Group so they have a genuine and compelling interest in the success of this business. Differentiation is a key factor in a strategy designed to separate the (ADNG) Australian Dairy Nutritionals Group (ASX:AHF) from the general dairy market in Australia and transform the company into an organic dairy products producer and brand owner. Previously named Australian Dairy Farms Group, trading in milk, yoghurt and butter under the Camperdown Dairy Company label, the Board of Directors commissioned a strategic overview in mid-2017 to outline the direction and the anticipated outcomes for the group for the next five years. Chief Executive Officer Peter Skene said the name change was made to better outline the company’s vision and its market position. “Australian Dairy Nutritionals Group will move from the high-volume low margin markets of conventional white milk products, to a vertically integrated business with a focus on premium products within the dairy market with the emphasis being organic and premium branded products. Transform our conventional dairy farms to certified organic dairy farms. Utilise rare Australian organic milk in premium value-added products. Enter high margin markets – Infant formula and Nutritionals markets. Utilise the strength of Australian organic milk to develop markets both locally and throughout Asian markets with an emphasis on China. Strengthen the management team in above capabilities and have the ability to execute the corporate strategy. He added that to convert from a conventional farm to certified organic was a three-year process, however, the undertaking was well worth the effort as the organic milk market was experiencing healthy growth both in Australia and overseas markets. Since listing on the Australian Securities Exchange with two farms as Australian Dairy Farms Group, the group has made a number of significant acquisitions, including an additional four farms; the Camperdown Dairy Company, a processor and manufacturer of milk products; a large dairy farm which will complete its conversion to organic certification in October 2019, (this farm alone will produce 7% of the entire Australian organic milk market); and Flahey’s Nutritionals, which has a presence in the Australian Certified Organic market with a specialised premium infant health formula product sold through the Australian pharmacy market. “What started in 2014 as a farm-based business has transformed to a land-owner business focussed on differentiated markets,” Skene explained. “We are now transitioning from a contract packer to a brand owner”. “We purchased 10 acres (4 hectares) of land to build a new state of the art milk processing, spray drying and pharmaceutical grade tinning and blending plant. This plant is designed to facilitate the movement of fresh milk from our farms to our facility within 20 minutes, making our products not only organic but incredibly fresh. “Milk is an amazing product. It can become cheese, milk powder, cream, ice-cream, yoghurt and infant formula. We particularly looked at the organic infant formula market largely because it only has one player in the Australian market, we also believe there is a significant gap in formulations within the Australian market and believe that these were good places to enter. “We see the current premium infant formula landscape or market as having some deficiencies in terms of supply. We see retailers running out of stock, we see imports supplying products we believe should be Australian grown and looking at the supply chain where all the materials come from, we see a lot of inefficiencies”, and thus opportunities for us. “The purchase of Flahey’s Nutritionals has given us an ideal entry into the market as they already market and sell an organic formula. “They have already spent time on the development of a comprehensive range of premium products with a ‘cradle to grave’ market position. The logical path for us is to go down a differentiated and formulaic path of business. “Under the Flahey’s Nutritional business we have already seen the start of export development with the Future brand trademarked approved for both China and Singapore. The Chinese market is growing at a rapid rate with an annual increase in infant formula sales at 9% per annum, however, the organic infant formula market is growing at an amazing 46% per annum. Chris Flahey, now director of sales and marketing at Australian Dairy Nutritionals Group, established Flahey’s Nutritionals in 2015, and was formerly sales manager at Bellamy’s Organic. Australian Dairy Nutritionals is currently producing organic bottled milk, butter and yoghurt under someone else’s brand from product supplied from other certified farms, however, once the first company farm completes its three-year organic conversion in November, 2019, the plan is to develop formula products for infants and adults under the company’s own brand. “To sum our situation up, the company has overcome the high barriers to entry of the organic milk market, it faces a market with fewer competitors, the promise of higher growth, attractive margins, less contract manufacturing, increased brand equity and greater returns for shareholders,” Skene concluded. The Board is pleased to confirm that Flahey’s Nutritionals has successfully registered the Flahey’s Future trademark in China in class 5, which includes infant formula and a range of other nutritional powders and supplements. Securing this trademark protection is an important step in the Group’s future plans to enter the Chinese market with a range of premium Infant Formula and Nutritional products. Last updated 10.43am 23/04/2019 (live) ?